Mark your calendars for Saturday, April 26th. I Love a Clean San Diego is holding its 12th Annual Creek to Bay Cleanup at sites throughout the county. The Cleaner Streets Initiative-Ocean Beach (CSI-OB) is recruiting volunteers for the OB Pier site, hosted by the Surfrider Foundation. The Cleaner Streets Initiative-OB group is dedicated to community beautification in OB, with the mission of keeping OB a beautiful place. Bob Dylan once sang that “the times they are a changing,” which today still rings true in OB. Yes, it’s true that OB is changing, and with change comes more crowds, busier streets, and unfortunately, more litter. These changes also bring a greater need for community activism. Luckily, the close-knit beach community has organizations like the Ocean Beach Town Council, I Love a Clean San Diego, the OB Rag, and Surfrider Foundation who support CSI-OB’s vision of pitching in to a give us all a cleaner OB. Spring has arrived, and with summer right around the corner, CSI-OB is looking for volunteers to march alongside the Creek to Bay volunteers, equipped with buckets and supplies to scour the beaches and streets of OB. Whether you’re a local, one who happily refers to oneself as an “Obecian,” (or “OBcean”) or someone who enjoys a day at the beach, a weekend, or just a night out on the town in OB, CSI-OB calls on you. “We’re looking for anyone who has ever said, ‘I love OB’ to come on down and give some of that love back,” said CSI-OB volunteer, Greg Crowley. You can support CSI and learn more about the Cleaner Streets Initiative-Ocean Beach at the CSI-OB Facebook page, www.facebook.com/CSIOBCleanerStreetsInitiativeOceanBeach . The next event will take place on Saturday, April 26th, in Ocean Beach from 9:00am-12:00pm. 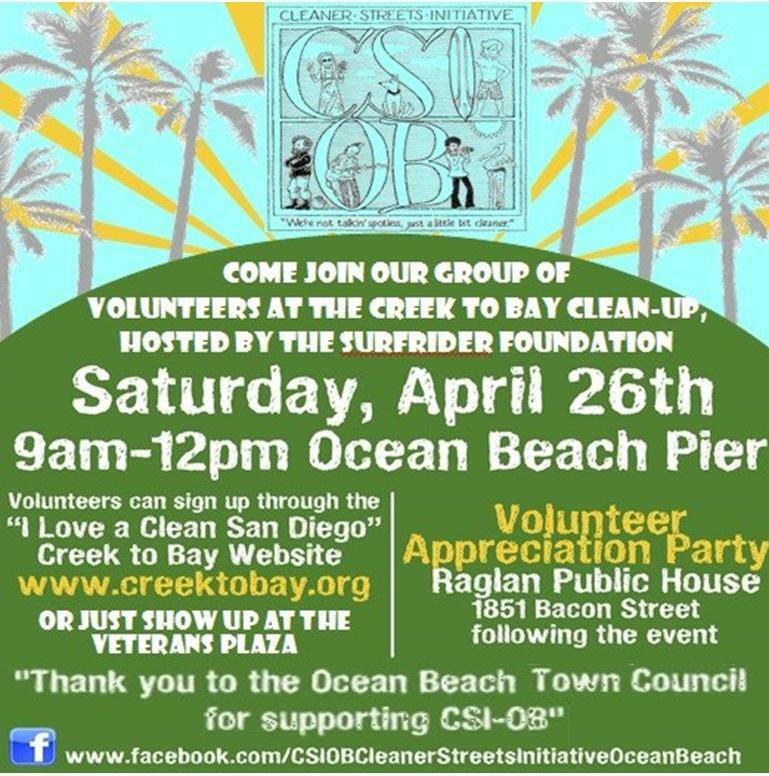 Volunteers will meet up in front of the pier, where CSI-OB volunteers can join Creek to Bay volunteers for a beach cleanup, or zig-zag their way through the streets, ridding the roadside and alleyways of trash. Volunteers are asked to bring reusable water bottles, gloves, and buckets if possible. Water, waivers, and other supplies will be provided at the Surfrider Foundation tent. Further information, including preregistration forms can be found at www.creektobay.org. CSI-OB also invites volunteers for a Volunteer Appreciation Party at Raglan Public House (www.raglanpublichouse.com), located at 1851 Bacon Street, following the event. Merchants are encouraged to donate gift cards, coupons, or OB swag to give away to hard working volunteers. Contact event volunteer Greg Crowley at obeciansunited@gmail.com if you can help them out. “Come gather ‘round people, wherever you roam…” Let’s help keep OB beautiful. I love OB and this idea, see you Saturday! Nice write up Johnny. A big thank you from CSI OB! Hope to see a lot of you out there on Saturday. Party at Raglan after!